When I write a short story or poem, I don’t normally think too hard about the characters’ names. Sometimes they come to me as I’m writing; sometimes I have them before I start. But in a novel, I find myself thinking hard about it. I should point out that the works I’m about to discuss are unpublished. In my first novel and the 2014 one, I needed unisex names to fit with the plots. The first was Christine Monkton because the forename could be shortened to Chris while the surname was borrowed from cartoonist Edward Monkton. In 2014, Charlie Dixon was how Natalie Charlene Dixon styled herself, and she worked as a car mechanic. Bizarrely, I visited a transport museum just after writing it and saw a book from a tram driver called Charles Dixon which referenced his daughter Charlotte. In 2011, I explored the idea of names a little further. The main character Josh Rush worked in an office where everyone was nicknamed. He’s known as Speedy. He works with Hostage, whose favourite phrase is My hands are tied, and a Country and Western fan called Dodge. But I’ve never put more thought into a name as Malcolm St Clement. The book is set in the 1960s, and I took the approach of pairing a relatively common first name with a distinctive last name, much like James Bond. 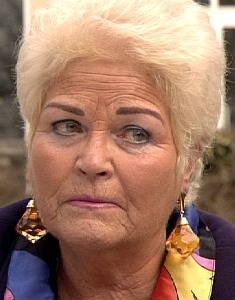 In fact, the only person I’m aware of with the same surname is Pam St Clement who played Pat in EastEnders. It took weeks of thought to find just the right combination, and I also wanted the first and last names to share some letters. I realise the latter requirement is rather arbitrary. The same applies to your own writing name; one day it might be in inch-high letters all over Waterstones, so it’s got to be right. Some people choose a pen name because it’s expected in the genre, or initials and a surname to remove gender preconceptions. Perhaps you’ve simply never liked your name and want to present a different public image. Readers of this blog know me as Gavin Cameron, but that too is a pen name. Cameron is actually my middle name and my last name is Cruickshank. I started using Gavin Cameron on hospital radio long before I started writing as it’s easier to hear and pronounce, not to mention that there are at least three other ways of spelling Cruickshank. Additionally, it helps to keep my writing separate from my day job. I wouldn’t normally admit my real name in a writing context, except to illustrate the point of writing names. One of my pet hates is reading a blurb that says I’m Jane Plain but I write as Faerie Queen. To me, a writer should choose a name that projects his or her writing personality and inhabit that name – a brand, if you will. I think Iain Banks did it particularly well. When he needed an alternative moniker for science-fiction, he wisely chose to modify his current name. In marketing circles, that’s called a brand extension, and it’s considered an easier ride than introducing a completely new brand. Whether it’s yourself or a character, you might need to look at these names for a long time, especially if it’s published, and might also hang around in the public’s imagination for years or decades. So if it’s jarring for you when you write it, it’ll be ten times as bad seeing it on a bookshop shelf. Previous Previous post: How to manage a writing group. Next Next post: Stepping off the train.